This chapter reviews approaches to neuroprotection that are based on reducing the excitotoxic effects of glutamate and related compounds. Evidence for a role of excitotoxicity in the brain damage that accompanies cerebral ischemia and trauma has been presented elsewhere (Choi and Rothman, 1990; Meldrum, 1990; Meldrum and Garthwaite, 1990; Olney, 1990) and will not be further reviewed here. 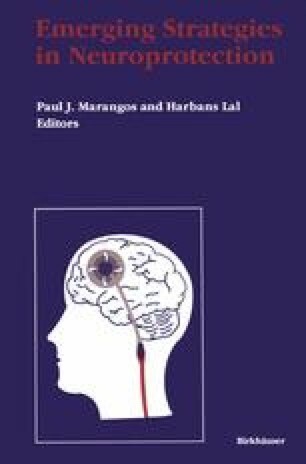 Nor shall we provide any review or analysis of the different animal models of cerebral ischemia and trauma in which putative cerebroprotective agents are currently evaluated [these aspects are reviewed by Meldrum, 1990, and in Chapters 3 (Hsu et al. ), 4 (Zivin), and 5 (Hayes et al.) of this volume]. Here we shall consider the various pharmacologic options for reducing excitatory effects, reviewing the drugs available for modifying the different stages of the excitotoxic process and the evidence for their cerebroprotective efficacy in animal models.